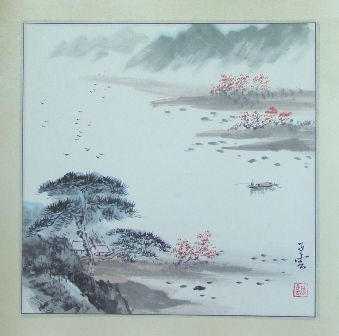 Original Chinese Landscape Painting Painted by Professor ZhiYun in China. Painting size: 13" x 13"; Mounted size: 15-1/2" x 15-1/2"
The painting is mounted with silk and ready to be framed. Artist profile: Professor ZhiYun teaches Chinese painting at JiangSu art academy. His paintings are featured by different galleries in Shanghai, Xian and Beijing. Professor ZhiYun also shows his work in Japan, and US. These paintings are his demo while teaching. So you can get his painting at very low cost. Professor ZhiYun also teaches workshops for artist China trip organized by Paragon International Arts.